Carving pumpkins at Halloween is a fun way to spend time with children, get creative and produce attractive seasonal decorations for your home. Anyone can carve a pumpkin, and designs can range from simple, straightforward spooky faces to more intricate designs. Whether you’re a beginner, helping children to carve their very own pumpkin, or if you feel confident enough to try more advanced methods, here’s our guide to carving your own perfect Halloween pumpkin. If you’ve never carved a pumpkin before, here’s how to start. First, choose your pumpkin. Bigger isn’t necessarily better, as it will involve more work, but small pumpkins can be fiddly to carve, so a medium-sized one is a good choice for your first jack-o’-lantern. Make sure it’s in good condition with no damage or mould present, and that it’s the shape you want – some more unusual shapes can make really effective designs. Lay down newspaper to protect your work surface – this will be a messy job! Use a serrated knife to cut a hole in the top of the pumpkin using a sawing action. Make sure the hole is big enough to comfortably put your hand inside – especially if you’re planning to light it with a candle or tea light. Cut at an angle down towards the centre, so the lid has a lip to sit on. Then, cut across the bottom of the lid to remove excess flesh and fibres. Scoop out the seeds and fibres with your hands or a spoon, and put them aside in a bowl. Don’t discard the seeds – you can roast them to make a tasty snack. Use a spoon to scrape out the flesh – leave the walls about half an inch to an inch thick. Make sure that the bottom of the pumpkin inside is flat enough to lay a candle or other light source on it. Again, don’t just compost the flesh, as it can be used to make pumpkin pie, soup, curry, or other dishes. Now it’s time to think about your design. You might want to practice drawing different designs on paper until you find one you’re happy with. Sometimes the simplest are the most effective, and they’re easier to carve. Once you’ve decided on a design, you need to copy it onto your pumpkin. In case you make a mistake, it’s best to use a red marker – which won’t show up when the pumpkin is lit up in the dark – or a dry-erase marker that can be rubbed off. Getting children to draw the designs onto the pumpkin is a great way to involve them without having to let them handle sharp cutting tools. Once you’ve drawn your design onto your pumpkin, it’s time to carefully saw along the lines with a serrated knife – older children can help, with supervision. Push the cut parts out from the inside. Carefully place a candle or tealight inside the finished pumpkin, or if you’re concerned that your pumpkin might get jostled or knocked over, for safety why not use electric lights instead? You can use flashlights, LED lights or solar lights, or if your light source is mains powered, cut a hole in the bottom of the pumpkin instead of the top so you can hide the cord. Strings of lights taped to a glass jar work well. Finally, display your pumpkin for everyone to see and enjoy the spooky effect! If you’ve tried pumpkin carving in the past and have been pleased with the results, you might want to move on to more advanced methods. To create more complicated patterns, it’s a good idea to draw a template onto paper (or download one from the Internet), fix it to your pumpkin and then transfer the design onto your pumpkin by poking holes along the lines with a needle or pin. Connect the dots as you carve. You can make any design you like – graveyard scenes, haunted castles, horror movie characters, spooky silhouettes…the choice is limited only by your imagination and skill. To make it easier to carve complex patterns, you can use an electric drill, wood carving tools, or you can buy special pumpkin carving kits. 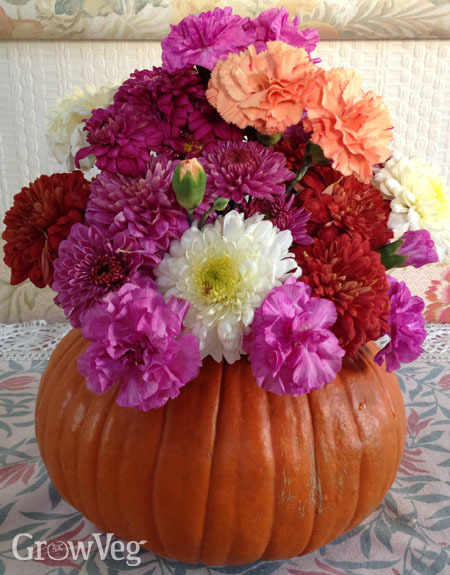 Or, for a more grown-up seasonal decoration, why not hollow out a pumpkin, line it with a clean empty food tin and use it as an ice bucket, a punch bowl, or a vase for cut flowers. Once you’ve mastered pumpkin carving and decorating, you might want to get serious about creating the best pumpkin in town. Etching your design into the skin of the pumpkin is a great technique. Use a sharp craft knife to carefully cut away the skin to create your design – cut right through in the traditional way in some areas, but less deeply in others so that the amount of light filtering through from the candle or other light source within varies and creates an interesting pattern of light and shade. If you want to create something really different, you can go a step further and sculpt a design into your pumpkin. To do this, first peel off the skin where your design will be. Use a toothpick to scratch the outline of your design into the pumpkin’s flesh, and then use carving tools to carve away the flesh to reveal your sculpture. Or why not try carving something other than a pumpkin? In Scotland and Ireland, turnips were originally the carving vegetable of choice. Turnips are more of a challenge than pumpkins, as the flesh is much harder and you’ll need a sharp paring knife or a woodworker’s bowl carving knife to carve out the inside. But, with care and skill, the effect can be just as good.